Track and waypoints: Approximately 70 waypoints, all created en route except just a couple created from the actual track. The track itself has been edited to remove backtracking and most side trips... and just generally cleaned. LW##QQQ = little water maybe. signs of water but I did not investigate. Logistics: There are lots of logistics. See also the links section at the end of this web page. Distance from Refrew to the campground, the ranger station and the Gordon River ferry is at least a couple miles. Bus of shuttle from "downtown" Renfrew to / from the campground, ranger station and ferry on the Gordon River. Bus or shuttle from "downtown" Bamfield to / from the campground, ranger stations and trailhead at Pachena Bay. First of all, in 1982 I wanted to hike this trail but no one would do it with me. 20 years later in 2005 I decide I'll find a way to make it happen. I read about it... I surf the web about it... I talk to everyone I can find who has done it... 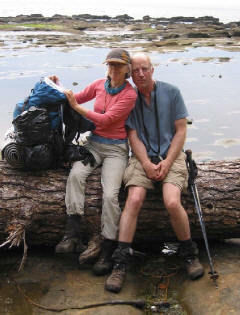 I hike a lot but don't have a lot of backpacking experience and my girlfriend Joan has pretty much none. So, the next two summers we practice for the WCT by hiking two 20 mile stretches of the Pacific Coast Trail on the Olympic peninsula (trip 1, trip 2). In May of 2007 I email everyone I know who might be remotely interested in joining us. 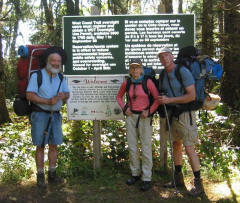 The hike is immensely popular in B.C. Canada. They have a world class wilderness trail in their backyard and everyone and anyone who hikes at all wants to do it... and they do. Hence the statistic the park rangers love to tell you - that during the hiking season one person is rescued on average every other day. 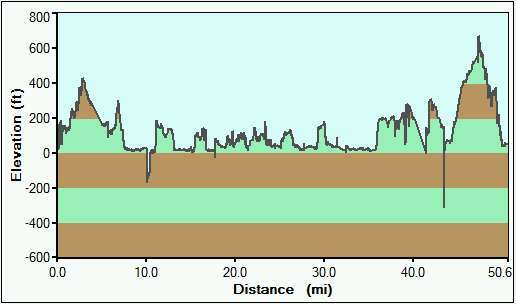 It's not that it's a particularly hard hike, the mileage is respectable (48), the elevation gain/loss is minimal, route finding is easy. It's more like there are just lots of obstacles and some of them are bound to be a challenge to anybody. If you're a really experienced hiker, you'll encounter few problems but if you're anything less there's bound to be something that challenges: maybe it will be the weather, or miles of soft sand, or unavoidable slippery rock, or scrambling over big rocks with a heavy pack, or the mud which can be epic, or the 20th time you fall on your can, or maybe it'll be a 100 foot tall ladder that confronts you with 40 lbs on your back. There's also a lot of logistics involved in making this trip happen: permits, reservations, U.S./Canadian money exchange, making sure your credit cards and cell phone will work in Canada, border crossing, passports, ferry schedules, various reservations, trailhead accommodations. The list goes on. Also, what kind of wilderness is this actually... the only one where you can you get served beer at not one but two places ! Life is uncertain. Do the honeymoon first. 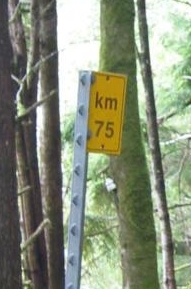 Historical note: The trail was originally a telegraph line to Bamfield. By 1906 so many ships had foundered in this area that it had earned the nickname "The Shipwreck Coast" and the "Graveyard of the Pacific". That year the Valencia wrecked losing 133 lives. The public clamored for something to be done and in 1907 the telegraph line was upgraded to a rescue trail. 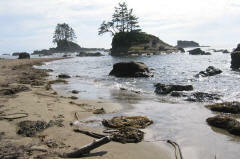 The trail was added to the Pacific Rim National Park Preserve in 1973. This year the trail is celebrating its 100th anniversary. Joan (my bride to be) and I leave Seattle in the morning. 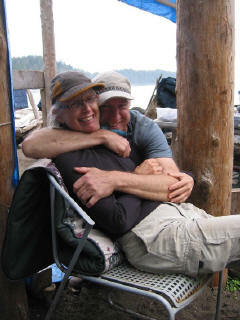 We're meeting our friends Jeff and Al in Anacortes, WA to catch the afternoon ferry to Sydney on Vancouver Island. It being the last ferry of the day, I'm a bit nervous about our meet-up but it goes without a hitch. Once we're on the ferry it finally feels like this trip has begun... This particular ferry to Victoria is probably the slowest but it is a beautiful, relaxed ride through the San Juan Islands... and then the ferry stops... for killer whales !!! I think this is a good sign. From Sydney we drive through Victoria, then east on 14. At Sooke we stop for gas and ask the locals about a good place to eat. They suggest a place (Marcus' Wharfside Restaurant) which is a bit spendy but this promises to be a very special trip so we splurge. The vittles a are excellent. "This is a hunting lodge!" Back on the road, we arrive in Renfrew about 11 PM when our adventure truly begins. We find the lodge where we've made reservations for the night but it's closed and no one answers the "after hours" buzzer. We wander around back where there is a house and some cabins thinking we'll find a note for us with a key and a cabin number. nope. No lights on anywhere. No people. Hmmmm? Down the hill we can hear music and merriment drifting up from a local pub and we think, maybe our hosts are down there having a beer. Nope. And nobody seems to know them either. Back up the hill we notice the tell-tale flicker of TV light from one guest cabin so we knock. The fellow who answers seems to know the hosts and is certain they must be around somewhere. He says the house is where the hosts live. So we bang on the door. No answer but the door is... open. I shout inside but no one answers. Al is back at the door to the front desk where he rings the night buzzer and here at the house it makes a hellish racket. I wander around outside the entire house and find no signs of life. We visit the helpful guest one more time and also the pub but can find no clue. So back at the house... I go in. This is getting a little creepy now. I shout "hulloooooo" REALLY loudly. I'm hoping I'll find a bunch of keys hanging on the wall or some paperwork with our name on it. Nope. Now what happens next I'm not particularly proud of but you have to understand, we're getting desperate. It's getting on toward midnight, we have to be up at 5 AM and we have no place to stay! I'm determined to at least make sure that there's no one home... so shouting "hellooo" I pretty much, uh... wander the house. Ok there, I said it. Shouting... finally someone opens a door and a guy sticks his head out who seems bewildered. I tell him our story which he relays to someone in the dark. Eventually a woman comes out who is spitting mad that I woke her up. "This is a hunting lodge" she yells at me. I guess that explains it. I apologize profusely and to her credit, she gets us settled in. I'm pretty long winded in the "trip report" department. Here's Jeff's synopsis of the entire hike. If you like a shorter, more concise report, read this and then there are some good links at the end of this page that are useful if you are planning a trip. At 5AM we're up to catch the boat to Bamfield at 6. We'd all be dog tired except that we're really excited. The dawn is breaking, the air is still, the sky is cloudless. It's going to be a gorgeous day. We find our boat and our captain. One last bit of business - we park where the locals tell us... but then more locals tell us we'll be towed if we park there. Arg. We move the cars onto the front lawn of Stan Medd (near the Port Renfrew hotel) and leave a note on the front door promising to pay when we get back... We leave our keys with a local and (gulp) we're out o' here. At 7AM the water in Port San Juan Bay is flat as a mirror as we depart. The ride is scheduled to take 3 hours or longer if there's stuff worth seeing along the way. You can also take a bus to Bamfield but everyone complains about the long, dusty ride on rough logging roads. This option isn't without it's potential drawbacks - rough ocean, sea sickness, rain, cold... but in fact the trip is pretty much perfect: with great views and zillions of sea lions. The one thing missing - no whales. Cap'n Brian Gisbourne totes around a lot of oceanographers and the latest poop is that the whales are not here this year and nobody knows why. Joan catches some zzz while the rest of us deal with 3-4 foot swells !? We arrive in picture perfect Bamfield about 11 AM and since the next Trail Orientation isn't until 1:30 PM, we have time to kill. While waiting for the bus we beg a ride from a local who gives us a lift to the campground/ranger station for the $8 a head the bus would have charged us. There's a pleasant beach here and I catch a nap in the shade. The orientation itself is required - here you pay for and receive your permit. Keep this. Later, you'll need to show it at the water crossings to get a free ride. The talk lasts about an hour. What I got from it was that the rocks are slippery, you WILL fall down, it WILL be muddy, pay attention to the tides, if you try to cross a surge channel you will surely die (I may be exaggerating this one a bit but only a bit). They also love to tell you that (and I quote) "On average, during the hiking season, we evacuate one person from the trail every other day". Puts the fear-o-god in ya from that one, eh? Oh ya, if you ask, they'll tell you where the latest critter sightings have been. They do give each member of your party a nifty waterproof map of the trail with a tide table affixed. 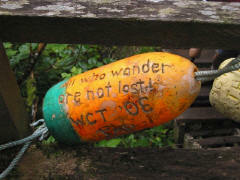 (The map and the trail itself both have kilometers marked. Very convenient. At 2:30 PM we are finally (FINALLY) on the trail. I'm so excited my pack (at the high side of 50 lbs) doesn't even feel heavy (kind of). The first 12 KM at this end is all inland. No beach, not even much sight of the ocean. It's very pleasant though. Almost immediately we are on boardwalk and then encounter our first "ladder". This isn't exactly what I was expecting. The "ladders" from my previous trips on the Olympic peninsula are thick wooden ties between cables that are HUNG on the cliff side. They are an adventure to climb as they kind of dance with you as you go up. This ladder. This ladder is more like the Cadillac of ladders, built with construction grade lumber. I almost expect to come around the corner and find a hot tub ! They are REALLY tall though. 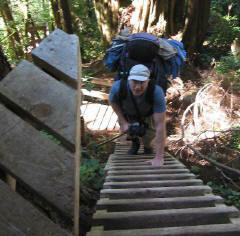 The rangers told us that this first ladder is the second tallest on the trail. That puts it at over 100 feet I think. I'm wondering how we'll all do with this obstacle and day-1-heaviest packs but no one has any problem. It is... Chutes and Ladders for grownups. We are cruisin'. Well sort of. Actually we've gotten a very late start and have heavy packs and Joan is tired and by KM 10 it's clear that we're not going to make it to Michigan beach with any light. The forest floor is very dense and brushy making camping here pretty much not possible. So we backtrack to KM 9 where there's a little trail to a viewpoint to where the sea lions like to hang out. We find a few flat spots in the forest there and make camp, make dinner, make hot chocolate with Jack Daniels and make night night. Funny thing about sleeping near a bunch of sea lions. They seem to party ALL NIGHT LONG. My first night on the trail I don't sleep so well and the noise keeps me awake too. After a while I swear I can identify each lion by its bellow. I give them names. There's "heavy breather" and the one that sounds like a chuckling Jaba the Hut, "clogged drain", "wet beer farts". By morning I feel like we're old friends. We enjoy a relaxed morning with breakfast, exploring the nearby cliffs and finally packing up. We visit the lighthouse briefly before descending to Michigan beach where "the boiler" in the break water is our first sign of wreckage that this trail is so famous for. It feels good to finally be on the beach. By the time we reach the Darling River the intermittent morning fog is gone. We hike inland along the river to visit the falls. The spot is idyllic with sunshine filtering through the trees. Where the sea lions hang Storm damage from 2006 Christmas? Back on the beach we find something... lost Soyuz capsule... canned spam? Not sure what this is but I rubbed it in case it had a genie living inside but no such luck. Sent it back out to sea. The beach walking is pretty easy past Darling. We see some big wreckage. The trail goes inland at Tsocowis creek. this is a cool spot - with waterfall onto the beach and stairs and ladders that climb up to a small suspension bridge. We're inland for about 3 KM. past the "derelict donkey engine and grater". 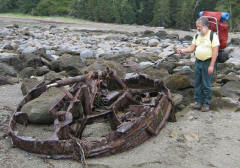 back on the beach at Trestle Creek we find more wreckage (the anchor). Here we're walking on sandstone shelf and there are millions of little black crabs. We are clearly invading their territory and every single one of them is prepared to joust to defend it ! We camp at Klanawa in the woods. We have the space to ourselves and didn't see many people today either. Joan: "I like the idea of an animal carrying all my gear"
Chris: "Do you have to fart like that on our honeymoon?" Snafu in the morning. Jeff and I opt to cross the river on the beach while Al and Joan use the cable car. I'm convinced the beach will be easy and faster which is true but then we miss the beach access point back to the trail and spend 20 minutes finding it. For our trouble we do get to see two bald eagles. When we finally catch up with Al and Joan we're only two minutes behind them but everybody is kind of pissed off. We hike inland for about 1.5 KM, gaining some altitude and meet a lot of hikers going the other way. After a bit we come to a fairly serious river. 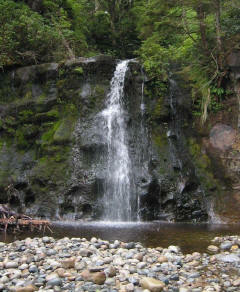 I don't realize but this is the Tsusiat R of Tsusiat falls. Not far past the river we come to the fork and series of ladders that leads down to the beach. Note - the toilet and the bear cans for this camping area are at the TOP of the ladders! This is usually a most popular spot to camp but it being mid-day there's almost no one here. We visit the falls. Now I've seen pictures of the falls and even saw the falls from the boat on the way to Bamfield but I never really got the scale. The falls are probably at least 40-50 feet high and look like something out of an old Tarzan movie. Another interesting thing - the seagulls are molting which means there are zillions of them on the beach. As you walk close to them they don't fly but rather just walk out of your way. After a while, you feel like Moses parting the "white sea". 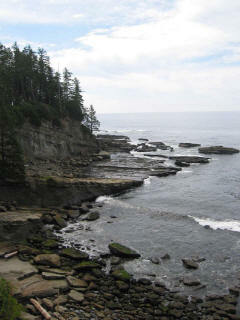 From here the beach walking is pleasant, past big sandstone cliffs to Tsusiat point. We just beat the tide through the hole. We encounter some more wreckage. Some seems more modern made out of fiberglass? We're 2 KM on sand and then back inland for 1.5 KM through IR 2 (Indian Reserve 2) where the character of the forest changes. At either end of the reserve is a sign that explains that this land is a spiritual sanctuary for the Indians and it's easy to see why. There are beautiful, big, old cedars here, the forest is tall, open, mossy, foggy. It "feels" different and everyone notices. Then another 2 KM or so further on, the trail passes above some really cool little pocket beaches, cliffs and coves. There's only two beach accesses I think, near the middle and near the east end. We didn't have time to explore here but next time this is a must. Hmmm I'm starting to notice that there's a lot of mud here. At Ninitat narrows the tide is coming in and there is a noticeable current running north! The crossing is easy though our boat captain says there are times when it's not. This is Carl's Place. He's friendly, tells jokes, talks about the family business - he sells baked salmon & potato or crab dinners ($20)...and beer ($5) !!! We are revitalized. After a big break we press on. The terrain changes radically at this point as the next section of trail just east of Carl's passes through a large swamp. The boardwalk is old here and almost melts into a hillside covered with multi-colored moss. Everything is glistening with wetness and more shades of green... and then just when you need it most, the boardwalk... just ends... and the swamp begins with a vengeance. I start to realize that I really haven't experienced mud yet but I'm going to experience it now. Still it is an immensely beautiful place. Then once we've gained enough elevation for the ground to dry the environment changes again and we find ourselves in a pine forest. One of the cool things about the WCT is all the different eco environments you find yourself in. We reach the Cheewhat river bridge near dusk and we're pretty beat. There's a "volunteer bear closure" here but we're too tired and not volunteering. We camp on the beach at the first access. There are no bear cans here but Carl had told us that the bear is only well upstream and doesn't bother the Indian fishing camp at the mouth of the river. "The forest service just over-reacts" he says. We have the whole place to ourselves. mmmm Cocoa and Jack Daniels tonight. At 4:30 AM I wake up and peek outside. The Auriga meteor shower is supposed to be happening tonight. I don't see nuthin'. We awake to another nice day (and no sign of bear). We get water at the spring back by the bridge. The Cheewhat River is also called the "'River of Urine" and nobody seems to write anything good about it but this morning with sunbeams through the fog it looks gorgeous. After a lazy start we're on our way around 11 AM. We decide to walk the inland trail east on the recommendation of a ranger who said the sand is slow and the trail is very pleasant... and it is. 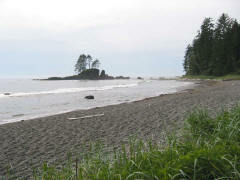 For the length of the beach, about 2 KM the trail is in great shape. There's some nice spots to camp in the trees here between the trail and the beach too. Then, I remember that yesterday, walking on the beach I saw a hiking boot. A perfectly good, single hiking boot sitting on a log. The reason I bring this up is that right about now, my left boot just up and explodes. The sole and the shank split the length of the shoe and it nearly fall off! I use duct tape and some straps to lash it onto my foot which works but I have zero confidence that it will last for the rest of the hike. 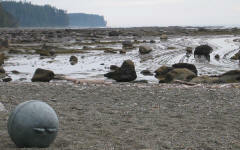 We continue to Dare Beach which is a really cool spot with alternating little sandy coves and rocky points. Dare beach is supposed to have tidal issues but the tide is already really high according to our tables and yet everything looks very passable. We are an hour before a very high tide of 12.1 feet and the map says this area is only passable at 7 feet or lower. Everyone in my group starts to get weirded out that if we continue we're doing something dangerous so I suggest that everyone stop for a snack while I run ahead to scout and find no problems. The group continues grudgingly... We walk a sandstone shelf well above the water to the west site of Cribs beach. Here we scramble down and wade through calf deep slack water to get back to the beach. That was all there was. At Cribs Creek beach we meet a couple where the woman has horribly bruised legs from crossing the boulders at Owen Point. This totally freaks Joan out. They were a font of scary news: Don't go east on the beach - tide problems, beach access to the east is "closed", there's a slippery clay washout... gak. I just wanted to get away from them. More reason for my group to get freaked. In any case we have an easy solution because there is an earlier beach access ahead that we can use. I'm not sure what's up today but the group seems to have no confidence! The beach here is really cool. It is just long and sandy but it has an interesting sort of geometry to it. Near the shore is a long sort of break water made of a sandstone shelf that parallels the beach. The shelf is tilted at an angle so from the beach it looks like a very broad ramp that rises out of the water. You can't see the waves on the other side of the shelf but every so often one hits with a crash and flies straight up in the air. Even less often a wave will hit that's big enough that it rolls right over the top and becomes a boiling cascade down the other side. Pretty cool to watch. The sand is firm and makes for nice walking. Joan and I are chatting up a storm and not paying any attention to our feet - for a change... when we almost walk right over the top of a seal pup ! The rangers told us that seal mommas sometimes leave their pups on the beach while they're out looking for food and not to bother them or momma might not take them back. We keep our distance. We do end up missing the first beach access and walk all the way to where the beach ends against Carmanah Point. It's clear that we've come too far. So we have a brief pow-wow about whether to walk back a kilometer to the previous access. I suggest that we at least check this out and see how bad it is. It turns out that the hillside has a spot that's wet and slippery but there is no sign that the trail is closed and it isn't dangerous and no one has much problem with it. In hind site and after looking at some other TRs I think this actually was the first (western) inland access. I think the beach trail continues east on rocks that looked impassable because of the high tide. We visit the light house which has immaculately groomed gardens, whale bones, and walk the labyrinth. We drop back down to the beach to visit Chez Monique where Monique serves up a mean burger ($12). She also sells beer, candy, energy bars, breakfast, fruit, TP and probably other stuff. I wish I had asked about batteries. She's a character (and knowledgeable) and will talk your ear off about just about anything - local politics, world politics, ecology, the logging industries, Indian rights, the park service... From here you can see the Olympic peninsula for the first time. (Just by the way, she has a boat.). Quote of the day: Joan - "I'm going to die any way, so I'll have my burger with cheese AND bacon". We tear ourselves away and continue on. Again we run into millions of seagulls. At Carmanah Creek we use the cable car - I'm worried that if I took my boot off to cross the creek I'd never get it on again ! This is my first time in a cable car. It's interesting, fun, awkward, and really hard work. It's immensely helpful, with four in our group, to always have two people at the tower who can help do the hauling. 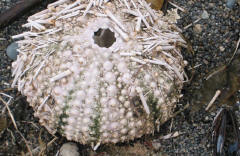 We continue mostly on sand to Bonilla Point. The point itself has some really cool sea stacks. The sunset is gorgeous. We camp near the waterfall. We get a late 10:30 start. It's cloudy and cooler today. The going is mostly sand and pebbles with one stretch of sandstone shelf. We run into a couple fellows in one cove who arrived by Jet Ski to surf. Their propeller got jammed by some nylon fisherman's net and they had no knife with them. They were glad to see us. 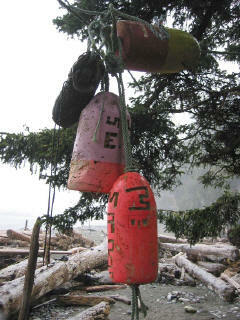 We arrive at Walbran Creek at 1:20 PM an hour and a half before the high tide of 11.2. The map says there are tide issues for the two kilometers proceeding Walbran and that it is not passable above 9 feet. The only real problem here is crossing the mouth of Walbran creek which is abutted on one side by cliffs so our only option is across the water. The mouth is awash with incoming waves as we arrive. We wait for a break in the wave train and wade across through knee deep water but any later might have been a problem. It starts to rain. We talk it over. It looks like it's going to last a while so we'll hang out here... It does last a while so we decide to go ahead and camp in hopes that tomorrow will be nicer. The straps I've jerry rigged to hold my boot together are wearing through from walking on rock so Jeff offers me one of the old, decrepit tennis shoes he brought for water crossings... and which I gladly accept. My alternative was using one of Al's sandals and I just couldn't see doing the WCT in sandals ! We have quite a bit of time to spare so we chat up some of our neighbors. t's a cosmopolitan place - Kiwis, Germans... We are the only Americans we've met on the trail. I also take up whittling. In the morning it's wet and humid but not raining. We're happy and outa here... The trail officially stays inland for 3 KM to avoid Adrenaline surge channel. Somewhere along this stretch my other boot explodes ! OK. So they were really old. Same failure mode: splitting the plastic shank lengthwise and the sole detaching. I contemplate trussing it up like I did the other but it's already too far gone. Luckily Jeff is nearby and loans me his other tennis shoe. I say a few words and commend it's soul to the deep (give it the heave ho). I'm now hiking in tennis shoes... really old... crappy... old... tennis shoes. To even call them shoes does a disservice to all the other shoes of the world. But they're mine. 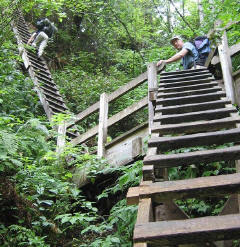 The next two kilometers have the biggest and tallest collection of ladders on the trail, dropping down to Logan creek to cross a spectacular suspension bridge, then back up, then back down to Cullite Creek and back up again. By the time we get to the bottom of Cullite the sun is out and sparkling through the trees. It looks like a good place to rest and hang out on the rocks and have lunch. An hour and a half later we're on our way again. The creek is low so we cross on foot instead of using the cable car and begin the long climb up the ladders and out of the canyon. It's 4 more kilometers to the next camping spot at Camper Creek. Chris and Joan Jeff's good side? I counted 40 rungs in this picture. Then it starts raining again, and the mud... gets muddier. I'm wet but I'm warm as long as I keep moving but Joan is wet and going slower. We don't get in till nearly dusk - Joan is discouraged and scared. She even mentions the 'R' word (rescue). We convince her that she should see how she feels after changing into warm, dry clothes, drinking some hot tea, eating some dinner, and having a good night's sleep. Warm, dry clothes make us all feel better. This place is tent city, pretty much a wall to wall line of tents along the entire edge of the beach. Another cosmopolitan place this. I hear Japanese, Australian and German. During the night it pours. 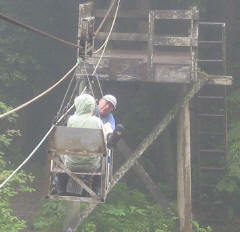 The creek is swollen so we use the cable car to cross. The weather gradually gets better but the trail is pretty much a mud hole. After about 3 KM we come to "beach access A". I am totally psyched to be back on the beach (which is actually sandstone shelf here). We were inland all of yesterday and all this morning. I really want to get out of the mud and into the sunshine - well what there is of it. But the rest of my group is afraid of slippery... and rocks... and the tide. I give up without much argument and we continue inland. We can't do Owens Point because the lowest tide today is 5.9 and the map says you need 6.0. Well, actually the map says that you only need 8.0 feet for the beach and 6.0 for the actual point AND we've been told that if the tide is in at the point you can actually still pass by scrambling over some bigger rocks. But I'm tired of fighting the FUD factor and Joan has been worried about Owens point since the beginning. So that part will have to wait for a future trip. Camper Creek cable car Mud, mud, mud, mud. Three more kilometers and then the trail starts to climb. You'd think this might cause it to dry out and be a little less muddy... NOT. Between "beach access A" and the trail high point near KM 71 there are a handful of nice inland camp sites but not all with obvious water... We meet almost no one on the trail. It's quiet, wet, green, beautiful, very open forest with lots of cedar and Douglas Fir. Reminds us all of hiking at home in the cascades. We pass the fork to Thrasher Cove where steps and ladders disappear in the mist down the hillside. It's obvious we won't get to the exit in time for the last ferry so our plan is to continue to the high point (about 670 feet) where there's supposed to be a camping spot. We find it and make it our home - though the only water is a 1/2 KM back to the west. We drink the last of our liquor and celebrate our last night on the trail. In the morning we're on the trail at 9, we pretty quickly find the giant donkey engine and finally slog it out to the Gordon River by 1 PM (4 hours, 4 KM !). The ferryman arrives, plucks the pennies from our eyes and delivers us to the next life. Our critter list: 12 eagles, chipmunks, river otters, starfish, sear urchins, boot chitons, anemones, herons, sea lions, seals and seal pup, snake, killer whales, mouse, raccoons, winter wrens, scoaters, cormorants, jays, mergansers, puffin, limpets, crabs by the gillion, salmon smolt, millions of seagulls, crows. 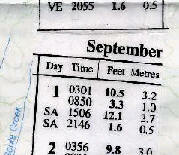 usage peaked in 1991 at over 9000 people, then the park limited use to about 7500 people over 5 months. 26 persons per day at either end for a total of 52 people per day. It actually sees about 5000 people per season. 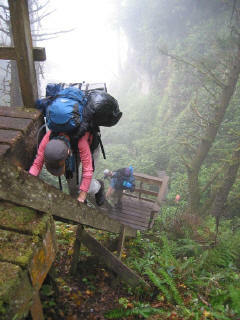 Note - there were some boardwalks that were pretty old but all of the ladders and bridges were sturdy. Last year (2006) there were some big wind storms with hundreds of trees down along the trail and a lot of other damage. The park service worked hard to clean everything up and repair what was needed and apparently did a great job. Travel east or west? Most people travel west, starting at Renfrew. This gets the elevation gain and the rocks at Owen Point behind you while you're still fresh. We opted to travel east so that we'd have lots of practice with the terrain and lighter packs by the time we got to Owen Point. You have to take everything the rangers say with a grain of salt. They are speaking to the lowest common denominator. Know your own ability. They'll tell you at the ranger station where bears etc have been sighted lately... if you ask. otherwise there are signs posted that tell you there are bears pretty much everywhere. Some of the signs look like they were put up a long time ago. 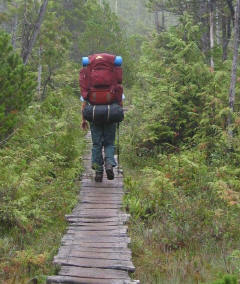 Hiking poles can help but practice with them before you bring them. It used to be that you could enter the hike in the middle via Nitinat Lake but this is no longer officially allowed by the park service. Carry cash on the trail - for Carl's "pub" or Monique's burger joint and/or emergency negotiations. We U.S. guys - make sure your credit cards will work in Canada. Ditto your cell phone. Lots of places do take visa but don't take Mastercard. Some ferries will take reservations. Bamfield is not hardly a town. One small food store. No cash machine. You can get water at the campground near the ranger station which is also the western trailhead. You can get reservations for the WCT. It costs $35 per person and in hind site, I don't think you really need them. 26 people are allowed to enter each trailhead per day and if you show up and don't get in, they guarantee that you'll go the next day. You'll read a lot of numbers about how crowded this trail is but a lot of that is from the old days. Before the quota system was created, the trail was very crowded and the number of visitor was high peaking around 9000 per season. The quota system was created in order to lower the numbers of users and it has succeeded. Hence, not nearly as many people are using the trail as in the past. If you're worried, consider hiking west to east - it's less popular so there are fewer people entering from that end. Reservations are non-refundable and you can only make them between 90 and 2 days in advance. All overnight hikers must attend a trail orientation which is scheduled at 9:30, 1:00 and 3:30 at the ranger stations near either trailhead and takes about 1 1/2 hours. You don't have to do the orientation at the end of the trail where you are starting. When you pay for your trail permit, the park service will give you a GOOD waterproof map of the trail and a tide chart for the expected duration of your trip. I read somewhere that the tide chart is for Tofino. Not sure why they do this since charts are available on the web for Bamfield and Renfrew too. The map can be viewed on the web (see links section below). Good camping in Renfrew at the campground near the ranger station. The Renfrew ranger station is within walking distance of the water taxi to the south trailhead. But it's not really walking distance from town. Water taxi fares are included in your permit. There are two required water crossings. Camp sites on the trail: Note that the most popular campsites on the trail are Thrasher, Camper and Michigan. This isn't because they are really cool. It's because they are convenient. Re parking in Renfrew while you're on the trail. 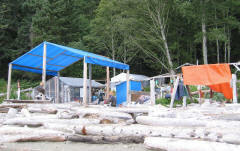 Stan Medd has been offering parking on his front lawn (near the Port Renfrew Hotel) for years. I think he's kind of an institution - mayor, police chief, dog catcher and parking attendant all rolled into one. He says his son-in-law is taking over the parking business... $4 per day per car is what we paid. I think I heard he might shuttle you to the ranger station/trailhead too. Also, just ask the rangers or the locals about parking. The Pub aka The Port Renfrew Hotel. near the water. We didn't eat or drink here but I saw that they had a good (by Seattle standards) collection of beers on tap. The Country Kitchen? or Coastal Kitchen? is the place we ate at on our last day. It was good and interesting and friendly. Near the ranger station and the campground for $1. There's an RV park in town with a little store (often closed) but a laundry and coin op showers that are open. Showers in Bamfield - don't know of any. Its a 1.5 hour drive from Victoria to Renfrew. As of 2007 the Google map directions are wrong. The average age of hikers looked to be about 25 though some parents have their teenage kids in tow ! When hiking south, your first hiking day starts with 7 miles of inland trail with no water access. The minimum tide marking on the map don't seem very accurate. Ask the rangers which are the spots where the tide is really not negotiable. Several points have little inland trails not shown on the map that bypass the tide problem (Tsusiat point for instance). Ask the rangers where these are. Ride at least one cable car. They are part of the novelty of this trail but they're also slow and strenuous and most can be avoided by wading the river if the water is low. http://members.shaw.ca/berry5868/juanfuca.htm or 1-888-755-6578. Approx $99 per person. $25 per person to reserve entry to the trail on a particular day. approx $128 per person for trail permits - paid at the ranger stations. You also pay $30 for the 2 ferry crossings at Nitinat Narrows and the Gordon river. 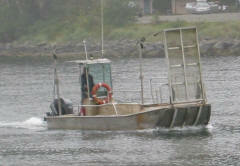 Cost of shuttle - We took a boat from Renfrew to Bamfield (4-5 hours) for approx $90 per person. The bus is a little cheaper and faster (3 hours). 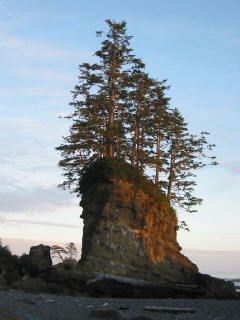 Ferry ride from Washington State to Sidney on Vancouver Island is about $50 for the car and $10 per person.